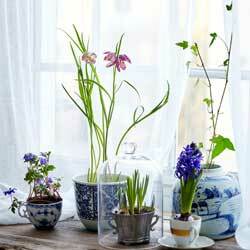 Potted tulips, crocus, hyacinths and daffodils add color to dull, dreary winter months. With proper care, these spring treasures can give you weeks of enjoyment long before their outdoor cousins poke through the soil, bringing a burst of color and life to your home even when winter is in full force. Stop by our greenhouse today and pick up some forced bulbs to brighten your home! Soil should be kept moist, but not wet. Do not allow the plants to stand in excess water, as this can cause rot that will destroy the plant. Be sure soil has proper drainage to keep excess water away from the roots. Place the plants in indirect light and keep them as cool as possible. The cooler the temperature, the longer the bloom period will be. Ideal temperatures are 55-60 degrees during the day and 40-50 degrees at night. The pot may be kept in the refrigerator at night if necessary, or move it to an unheated garage or basement to chill out overnight. Placing pots near a window and away from heating vents can help keep them cooler. When the flowers fade, cut off the flower stems near the soil level. Take care not to cut into the bulb, however, as the damage could impact any future blooming. Do not cut away foliage – it will continue to add nutrition to the bulb’s storage. Instead, allow the foliage to remain intact until it withers naturally, whether it is still in a pot or has been planted outdoors before wilting. Bulbs cannot typically be forced indoors a second time. Instead, transplant the bulbs into the garden in the spring with a handful of bone meal in the hole and in a suitable location and soil type for the flower. Allow the foliage at least 6-8 weeks in the ground to gather energy for next spring. Many forced bulbs will not rebloom immediately when planted outdoors, but with patience and good care, they may recover from being forced and could become an integral part of your spring landscape just as they were part of your indoor landscape in winter.